So I Installed Garry’s Mod. Now What? If Steam’s trading cards have accomplished one thing, they’ve gotten me to actually install and boot up some of the games on my backlog. One of those has been Garry’s Mod, which I surprisingly only just bought this year. I’m still not sure what I’m going to do with it. The thing is, I’m not really too keen on what I’d call “total sandbox” games. I used to love making my own fun within the constraints of conventional games, but for some reason I can’t really bring myself to do anything in games designed explicitly for me to make my own fun. This is exactly why I haven’t gotten into Minecraft. The thing that finally prompted me to buy Garry’s Mod was the recent creation for it, “gmDOOM” which basically let’s me play through Half-Life 2 with weapons from DOOM and DOOM II. 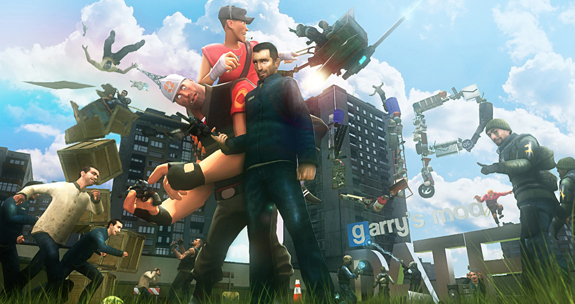 And that’s basically what I’ve done with Garry’s Mod. Going through Valve’s superb level design with the feel of id Software’s excellently-balanced guns is a refreshing experience. Having to fight Combine soldiers with the Super Shotgun, use conventional rockets against gunsihps, and kill striders with the BFG9000 adds legit new challenges to the game. After doing that I tried to look up some other mods and noticed the prominence of “Trouble in Terrorist Town,” which is apparently the reason people boot up Garry’s Mod these days. See, I don’t really get into too many multiplayer games, not when dominant ones already exist in my life. The only multiplayer Source engine mod I’ve come back to more than once is NeoTokyo, but multiplayer seems like almost all there is with Garry’s Mod outside of character skins. I don’t really mess around with posing characters together either. Eventually I just found another mod that let me play through HL2 again but with all the weapons from Counter-Strike Source. I enjoyed it a lot because the weapons felt great in their own way and sounded far more powerful than HL2’s default arsenal. I’ve tried spawning vehicles and other things into one of the blank sandboxes but I guess I just don’t have the right imagination to do much with that kind of thing. I need a little bit more structure. Garry’s Mod is probably still immensely valuable as a tool or a toy from which you can get potentially endless fun, especially for the price of $10. The last time I “made my own fun” in a game was probably the super sledge cheat in Red Faction Guerrilla. That one cheat is the main reason I still don’t plan to ever uninstall the game.